Distance indicators are classes of objects and/or of phenomena which allow us to measure the distances of celestial bodies through other observables such as luminosity or size. For this reason they are also called standard ladders. becomes known provided that one measures estimates and and knows a priori the value of the absolute magnitude If the latter condition is satisfied, this makes the source a good candidate to become a photometric distance indicator. But it is not the only clause. The sequence of cosmic distance indicators, with their ranges of applicability and their overlaps. Notice that each successive indicator is calibrated against the previous one, with an inevitable error propagation. cosmological effects are accounted for (when the case). evolving slowly or in a predictable way. The question is: how can we calibrate a photometric indicator? The answer is: usually by comparison with another, already calibrated indicator. This is clearly possible only if there is at least one indicator which can be calibrated (at least indirectly) with trigonometric parallaxes. In 1912 Henrietta S. Leavitt, in collaboration with her director, E.C. Pickering, published an Harvard College Obs. Circ. (vol. 173, pp.1-3) on the Periods of 25 Variable Stars in the Small Magellanic Cloud, containing a fundamental correlation between the average luminosity and the period of the light curve (PL relation) for the family of variable stars known as Cepheids after the prototype, δ Ceph. 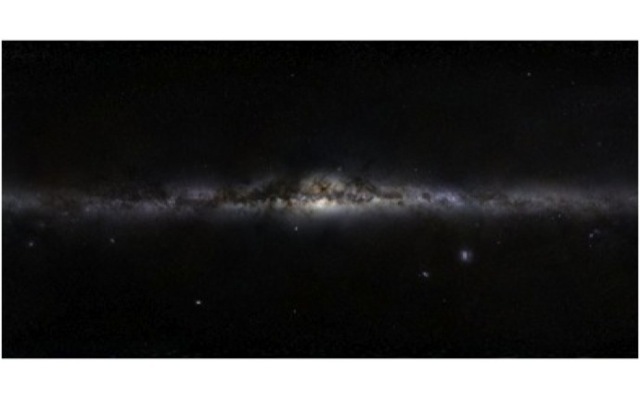 The discovery was made possible by the fact that the stars belonged to two nearby (nonetheless distant) galaxies, the Magellanic Clouds, so they all were, for each galaxy, approximately at the same distance from the observer. 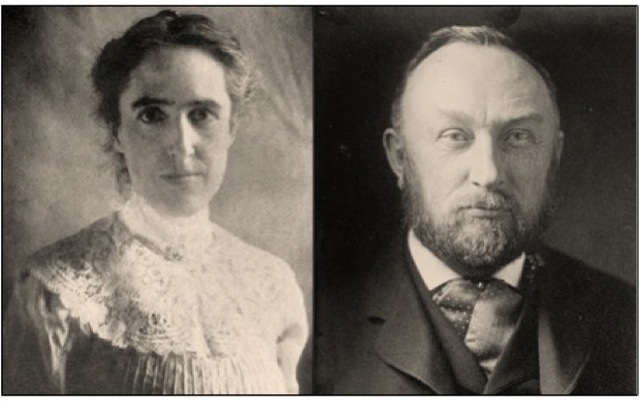 Henrietta Swan Leavitt and Charles E. Pickering. The relation: where is the period of the light curve [see ahead], has a slope and a zero point It has been proven that is more or less constant going from galaxy to galaxy (nearby). The zero point has to be calibrated in such a way that turns into an absolute magnitude. Then the PL relation becomes a powerful distance indicator. In fact, you measure the apparent magnitude and the period of a Cepheid at an unknown distance via the PL relation compute the absolute magnitude and you readily have the distance modulus to be further corrected for absorption. It is by this way that in the early 1920 Edwin Hubble proved that the distance of NGC 6822 and (later) M31 was far in excess of the size of the Milky Way, thus proving that this nebula had the same rank of our own galaxy. It was the proof that Kant’s hypothesis on white nebulae (now spiral galaxies) as “island universes” was the right one. 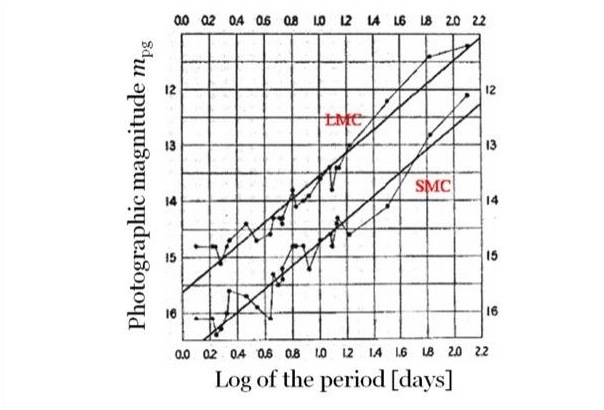 Miss Leavitt's original Period-Luminosity relation for the Large and the Small Magellanic Clouds. Same as above, with P in logarithmic scale. 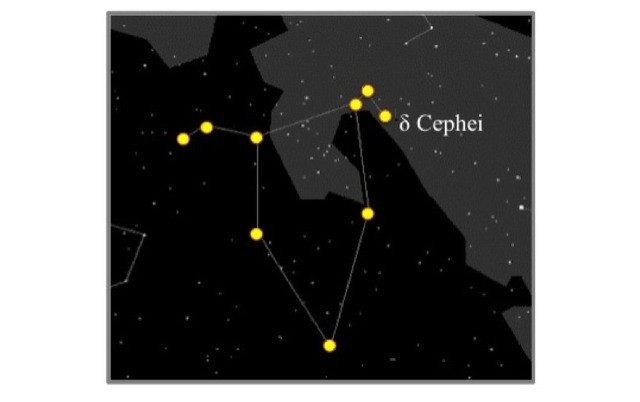 Cepheids are rather luminous and massive Population I (young) variable stars. The light curve (figure) is periodic , with a tooth-saw trend The average amplitude of the light curve decreases with increasing wavelenght of the observing band: for instance, and . The average color index is . 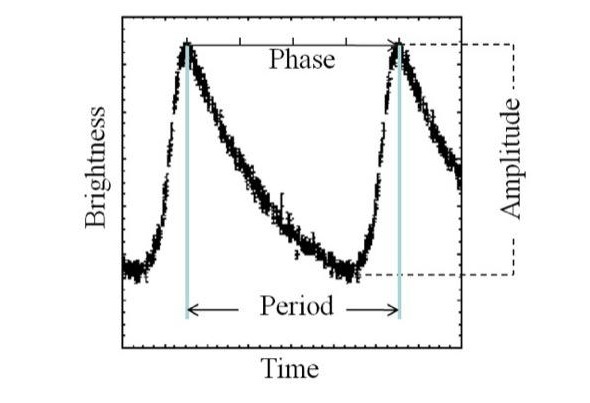 Typical tooth-saw light curve of a Cepheid. The Galactic disk, rich in dust. Credit: ESO. It is with Cepheids that, in the early 1920’s, Edwin Hubble proved that the distance of NGC 6822 and (later) of M31 was far in excess of the size of the Milky Way, i.e. that this nebula had the same rank of our own galaxy and that Kant’s hypothesis on “white nebulae” (now spiral galaxies) as “island universes” was the right one. Hubble adopted a calibration for Cepheids provided by Harlow Shapley. It was based on the assumption that RR Lyrae, pulsating variables with and constant luminosity, which he had found in some globular clusters of known distance, would represent the faint tail of the PL relation holding for Cepheids. This was indeed true, but for a another type of variables, akin to Cepheids but of Population II, named W Virginis, which are in fact 2 mag fainter than classical Pop I Cepheids on average (figure). 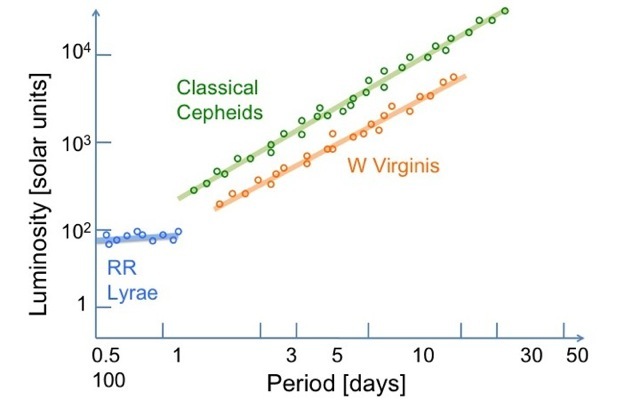 The PL relation for pulsating stars: classical Cepheids, RR Lyrae and W Virginis. 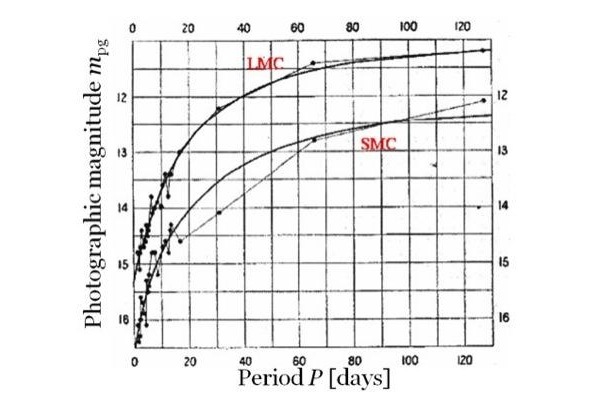 The figure shows the Period-Luminosity-Color relation for Cepheids of the SMC from OGLE-III data (Soszynski et al., 2010), with the parallel relation (red) for the first overtone mode. The inset reports the Period-Luminosity relation available in 1960’s (from Shapley’s Galaxies, Harvard Univ. Press, Cambridge, MA, 1961). Notice the much larger dispersion compared to the modern data. Improvements in the PL relation. 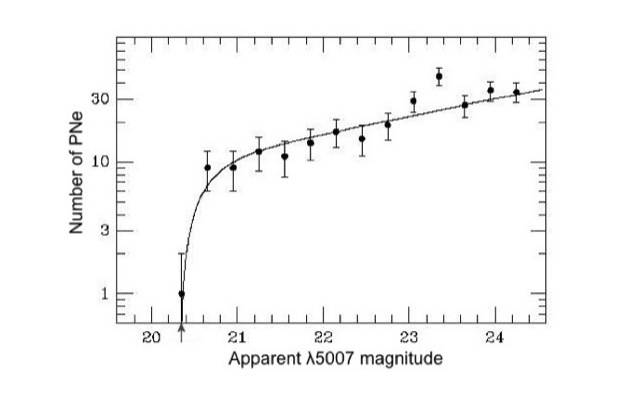 From Soszynski et al., 2010, Acta Astron., 60, 17. The figure shows a method used to correct for extinction the observed monochromatic moduli and derive the de-reddened true modulus. It is based on the extrapolation to infinite wavelength (i.e. to zero effect) of an extinction model (cf., for instance, that of Cardelli et al., Ap.J., 345, 245, 1989) rescaled to the uncorrected values of the distance modulus derived for some colors (4 in the case shown). Notice the perfect fit. Data are relative to the small S/Irr NGC 3109. Adapted from Musella, Piotto, Capaccioli, 1997, Ap.J., 114, 1976. Proposed by W. Baade in1926 (Astron.Nacht., 228, 359) and developed by A.J. 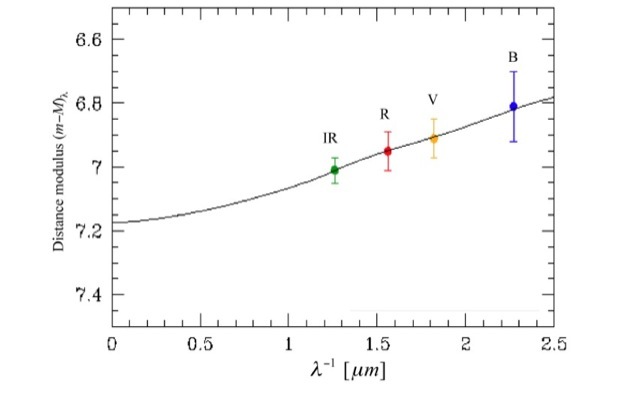 Wesselink in 1946 (B.A.N., 10, 91), the method applies to distances of pulsating variables as RR Lyrae and Cepheids and rests on measurements of magnitudes, colors, and radial velocities along the oscillation cycle. While of difficult application, it has the merit of being independent of other distance indicators [understand the advantages]. Thus, the problem of the distance is solved if one knows the simultaneous values of the radius and of the effective temperature. If the object is a black body, its temperature is provided by the color. In practice, one assumes a biunivocal correspondence between color and effective temperature, and the two epochs are chosen so that the colors are the same. Having measured the apparent magnitudes, and the colors to correct for extinction, one will have the value to compare with the absolute magnitude to find the distance. 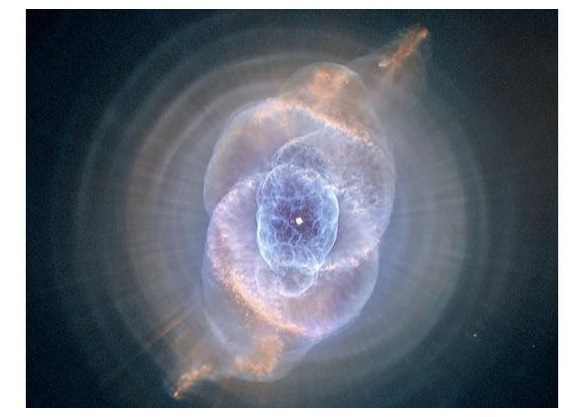 A planetary nebula (PN) is an emission nebula [how many kinds of nebulae do you know?] where a hot and luminous central star powers an expanding shell of ionized gas. The shell is expelled during the Asymptotic Giant Branch (AGB) phase via pulsations and strong stellar winds, unblanketing a hot core radiating UV radiation. PNe are short-lived ( ) late phases in the evolution of intermediate- to low-mass stars, which eventually evolve into white dwarfs (WDs). They play a critical role in the chemical enrichment of galaxies (C, N, O, Ca). NGC 6543, the Cat's eye pictured by HST. Credit: NASA (HST). Typical spectrum of a Planetary Nebula. 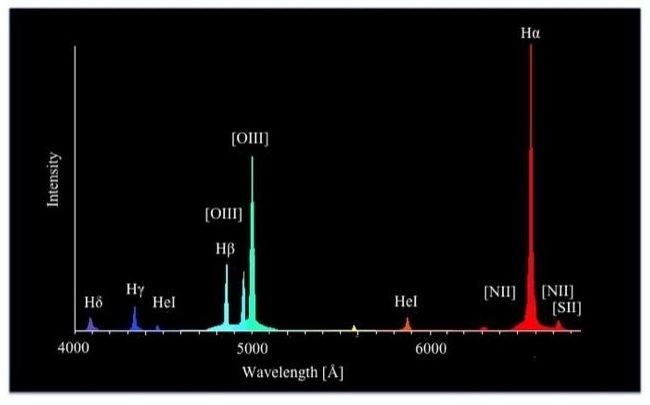 The emission spectrum offers us the way to disentangle PNe from the diffuse light background of a galaxy: it is enough to compare an image of the host galaxy taken through a very narrow filter centered on [OIII] galaxies which present a similar behavior and must be flagged out. PNe are quite useful as dynamical tracers as it is relatively easy to measure their radial velocities. It is found that the distribution of planetary nebula [OIII] brightness in a galaxy follows the so called planetary nebula luminosity function (PNLF): where ( ) is the cutoff magnitude (no PN brighter than this). The PNLF, which is marginally affected by changes in metallicity, has been considered a valid distance indicator. 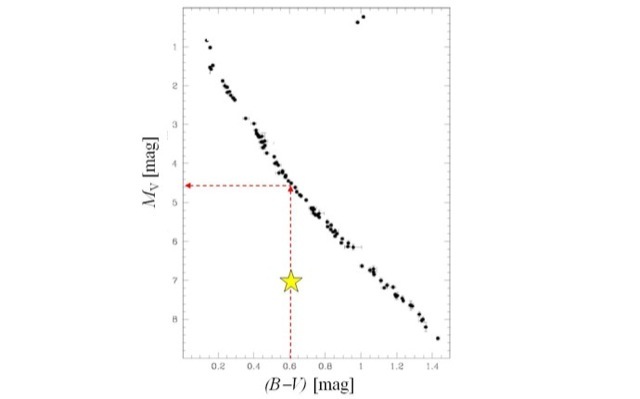 Luminosity function for M31 PNe (from Van de Steene et al., 2006, A&A, 455, 891). 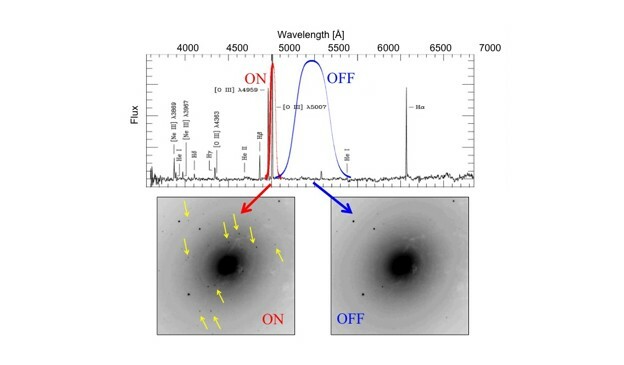 On-off technique to identify PNe by comparing a narrow-band image centered on the Oxygen line at 5007 \AA with a broad-band image at the nearby continuum. A way to derive the absolute magnitude of a star from the color (or, better, the effective temperature). G. Bertin, Dynamics of Galaxies. Cambridge Univ. Press, 2000. J. Binney & S. Tremaine, Galactic Dynamics, Capter 6, Cambridge Univ. Press, 1987. J. Binney & S. Tremaine, Galactic Astronomy, Capter 10, Cambridge Univ. Press, 1998. C. C. Lin & F. H. Shu 1964, Ap.J., 140, 646, 1964. A. Toomre & J. Toomre, Ap.J., 178, 623, 1972. W. Freedman, "The Measure of Cosmological Parameters", stro-ph/0202006. R. Sanders, "Observational Cosmology" astro-ph/0402065. J. Jensen, J. Tonry and J. Blakeslee, "The Extragalactic Distance Scale", astro-ph/0304427. S. van den Bergh, "The cosmic distance scale", Astron. Astrophys. Rev, vol. 1, no. 2, 111, 1989. D. Alloin and W. Gieren, "Stellar candles for cosmic distance scale", Lecture Notes in Physics, vol. 635, Springer, 2003. 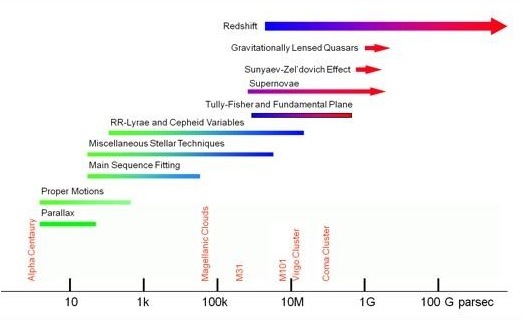 "The extragalactic distance scale", proceedings of the Space Telescope Science Institute (U.S.), eds. M.Livio, M.Donahue, N.Panagia, Cambridge Univ. Press, vol. 10, 1997. D. Hogg, "Distance measures in cosmology", astro-ph/9905116 (see also Hogg et al., "The K-correction", astro-ph/0210394. G. Jacoby et al., "A Critical Review of Selected Techniques for Measuring Extragalactic Distances", PASP, 104, 599, 1992. 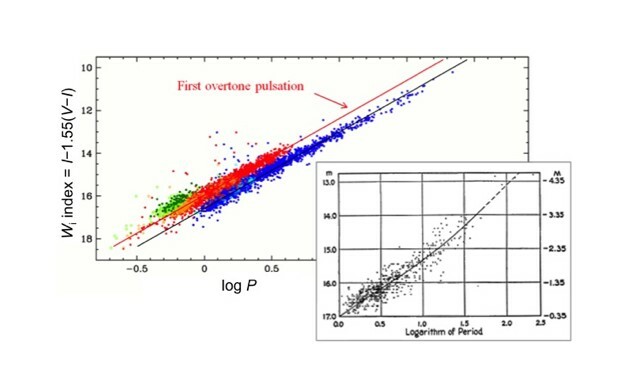 W. Freedman et al., "Final results from the Hubble Space Telescope Key Project to measure the Hubble constant", Ap.J., 553, 47, 2001.